This Kreature was designed for aquatic and subterranean combat. It travels between land and sea by diving into deep-sea thermal vents, swimming beneath the earth’s crust, and emerging from the craters of volcanos. It can turn its body into a furnace with core temperatures exceeding 2000 F, transforming the rocks it carries inside its crop into magma, which it will spit at its opponents. 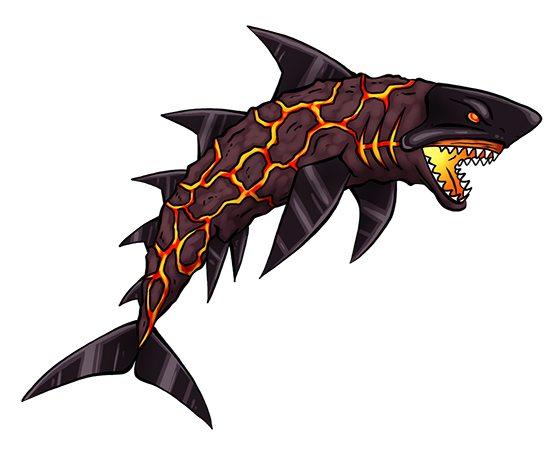 Its teeth and fins are sharper than obsidian and can be superheated as well. Take a shark monster, put it in a volcano and you get Magmako!!! But seriously, Magmako is a solid design. I really enjoy the obsidian-like fins.